The polling candidate for 2016, Deez Nuts, has just released his official presidential endorsement list to the media. A last-minute t-shirt discount can be found here. While there has been speculation on which Republican or Democratic front-runners would be picked, the list has finally been revealed. 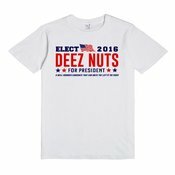 In what might come as a shock to some, Deez Nuts 2016, is actually leaning both Democratic and Republication in his stance on presidential politics. To support the promotional efforts, some merchandise and other goodies have been released to the public.